Before you uproot your staff and start throwing things into boxes, take a few minutes to think about why the move is necessary. Have you outgrown the current space? Do you need something that the current office just can’t provide? As you make these determinations, verify that the new office will meet your needs, allowing the company to continue to grow. Though a move is disruptive no matter when it happens, ideally you want to make sure this transition takes place during a time of year when you’re not on your tightest deadlines. If you have a project that must be done by February 1st, it’s probably not wise to begin a move in January. Think about your business and your clients, and use these factors to schedule your relocation. This will help keep stress to a minimum. It’s easy for chaos to break out when you’re in the midst of an office relocation. To prevent this from happening, make sure you’re communicating closely with your staff. They should be aware of upcoming deadlines. For instance, if they need to clear out their desks by a certain time, make this known far in advance. If the office’s computer system will be impacted during the move, make sure this is abundantly clear. Not only should you invest in a professional moving service to get the job done, but you may also want to consider hiring a project manager to help guide your business through the move. This helps to prevent important details from falling through the cracks, and prevents the entire process from becoming a major headache for you. 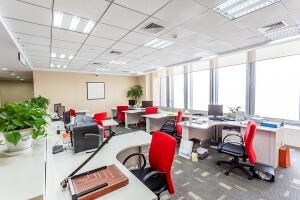 How did you manage your office’s relocation successfully? Let us know in the comments!